Unsung hero saved 669 Jewish children - recognized on TV 50 years later...touching. On the brink of World War II, Sir Nicholas Winston, now 105, organized the rescue of 669 Jewish children and saved them from death by the Nazi regime. Nicholas Winton is a true hero who never sought fame or glory. Years after his heroic act, his wife found a scrapbook in their attic with names of all the children he had saved nearly 50 years before. It all started in 1938 when he was going on a ski trip to Switzerland. He changed his mind about the trip and decided, instead, to help a friend in Prague with some humanitarian work...and the rest is history. How wonderful it would be if there were more Nicholas Wintons in the world. This video touched my heart. Please send it along to inspire others also to do good. This video was just recently published on Youtube - it is "hot off the press". When I started writing about it, it had 899 views. Just a half an hour later, it had 2,361 views. It originally aired on BBC's That's Life in 1988. To learn more about this story, visit Nicholas Winton on Wikipedia. 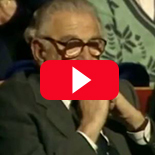 To see more stories similar to Nicholas Winton's, be sure and visit our inspirational videos page. For a little different type of experience, visit to this page for some Inspirational Christian Movies. Faith in Humanity is Restored by This Touching Display of Sportsmanship. 7 Famous People Who Failed...bet you'll never guess all of them. After Harshly Judging His Appearance, People Were Amazed by His Incredible Talent. The Amazing Story of a Man with No Arms or Legs...and How He Beat the Odds. Arguably the best coach of all time...and what he says that most of us forget. How can a pep talk from a kid inspire 33 million people? Put your problems in perspective as you learn about this boy who had cancer.